The Munich-based designer worked with Vibia to develop a lighting collection that explores the light conducting abilities of glass. Each lamp features a strip of concealed LEDs that shine light through a glass diffuser. The conducted light catches the edges of the glass and the patterns etched into it. The project began with an exploration into the relationship between light and transparency. Diez tested different materials, such as paper, PVC, acrylic and glass for their light reflecting ability. Diez found glass to be the most reflective material. "Light conducted by the glass is invisible, only emanating at the edges," he explained. 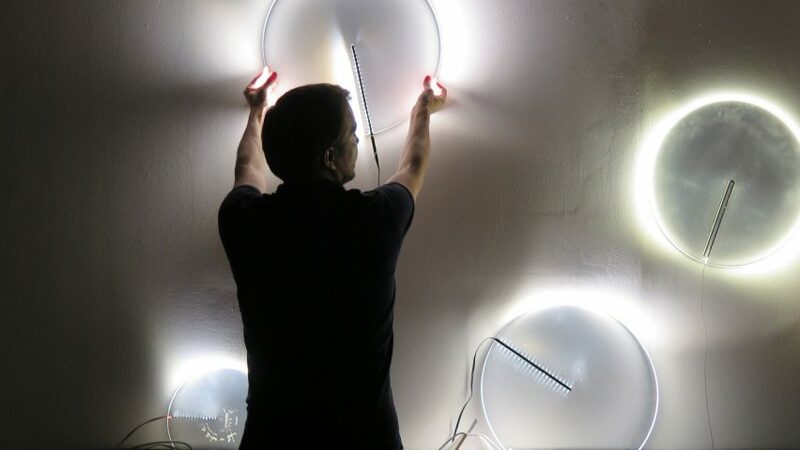 The German designer began by creating a wall lamp made from a thin disc of glass. "In the case of the Guise wall lamp, this quality of the material takes on a phenotypical shape that harks back to an archaic imaginarium," he said. A slim black strip of LEDs recessed into the glass disc diffuser conduct light through the glass, which then escapes through its edges – creating a bright halo-like glow that reflects off the wall. "The luminous quality of Guise evokes associations of celestial bodies," said Diez. Following the creation of the wall lamp, Diez and Vibia developed a series of table and suspension lamps. The light source itself always remains invisible in each one. In the case of the pendant and table lamps, the light from the LEDs emanates from patterns etched into the cylindrical glass diffusers. Diez is not the first to create lights of this kind. Earlier this year New York design studio Yabu Pushelberg created a crystal lighting collection in collaboration with Czech glass manufacturer Lasvit. Similarly, the slender cylindrical lights are hand-etched with clean-cut vertical lines that catch the light from hidden LED sources within the lamp's brass connection points. Diez, who has worked as an assistant to both Richard Sapper and Konstantin Grcic, opened his own studio in Munich in 2003. He's collaborated with several brands, designing chairs for German furniture company e15 and office furniture for Hay.